An island nation, Japan was vulnerable to a block­ade of essen­tial food and stra­tegic mate­rials. On this date in 1945 the U.S. Army Air Forces and the U.S. Navy, hoping to put the final nail in the enemy’s coffin, kicked off Oper­a­tion Star­va­tion, the aerial mining of Japa­nese waters. Three nights later 85 more “miners” followed suit. 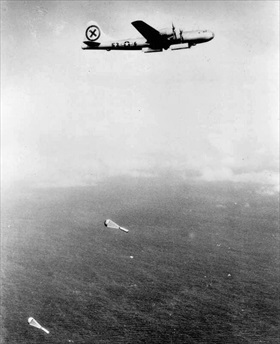 By begin­ning the night­time aerial dropping of mines (even­tually 12,000 mines) in rivers and coastal waters, Maj. Gen. Curtis LeMay’s Mari­anas-based B‑29 Super­for­tresses accessed Jap­anese waters too shallow or close to land for Allied submarines to enforce a sea blockade. The five-month-long aerial cam­paign saw the near destruc­tion of Japa­nese coastal shipping and shipping lanes, halting Japan’s impor­ta­tion of criti­cal raw mate­rials and food and forcing the aban­don­ment of 35 of 47 vital con­voy routes. Adding LeMay’s incen­di­ary raids on ur­ban and mili­tary-in­dus­trial areas to the destruc­tive mix reduced Japan’s over­all pro­duc­tion in 1945 by two-thirds com­pared with the year before. Already in 1940 rice—the chief item in the Japa­nese diet—had been sub­ject to rationing due to bad har­vests in the Japa­nese colony of Korea and the demands of the Japa­nese mili­tary in China (since 1937) and South­east Asia (since 1941). Fish, the other dietary staple, had all but ceased to be distrib­uted in some areas in 1944. Food supplies were so mea­ger that the aver­age Japa­nese citi­zen was living at or near star­va­tion level. Average civil­ian caloric in­take in 1945 was 78 per­cent of the minimum needed for health and physical performance. By the end of June 1945 the civilian popu­la­tion began to show signs of panic. Experts pre­dicted deaths by star­va­tion would exceed seven mil­lion were Japan to some­how mus­ter the will and resources to wage war through 1946. With the bene­fit of hind­sight, Japan’s for­mal sur­ren­der on Septem­ber 2, 1945, was inev­i­table even with­out the U.S. immo­lating Hiro­shima and Naga­saki, with­out the Soviet Union’s entry into the war on August 8, 1945, and with­out the ghastly num­ber of cas­u­alties pro­jected by an Allied inva­sion of the Japa­nese island of Kyū­shū in late 1945 and the main island of Hon­shū in April 1946 (Operation Down­fall). But the hor­rors of the Paci­fic Is­lands cam­paign were so fixed in the minds of U.S. mili­tary and poli­tical leaders that the fire-and-sword stra­te­gy of using atomic wea­pons appeared to be the least costly way to bring World War II to an end. Left: Overseen by Maj. Gen. Curtis LeMay, Operation Star­va­tion was a joint U.S. air and naval effort to strangle Japa­nese mari­time traffic by the aerial mining of Japan’s har­bors and straits. The main objec­tives of Opera­tion Star­va­tion were to pre­vent the impor­ta­tion of raw mate­rials and food into Japan, pre­vent the supply and move­ment of mili­tary forces, and disrupt shipping in Japan’s Inland Sea, the body of water that separates Honshū, Shikoku, and Kyūshū islands. Beginning on March 27, 1945, B‑29 Super­for­tresses assigned to Opera­tion Star­va­tion dropped 825 para­chute-retarded influ­ence mines with mag­ne­tic and acous­tic explo­ders. The ini­tial sortie was followed up on March 30 by 1,528 more. Some models of mines had water-pressure-displace­ment explo­ders. Aerial mining proved the most effi­cient means of destroying Japa­nese shipping during the war. In terms of damage per unit of cost, it surpassed the stra­te­gic bombing and the U.S. submarine campaigns against Japan. 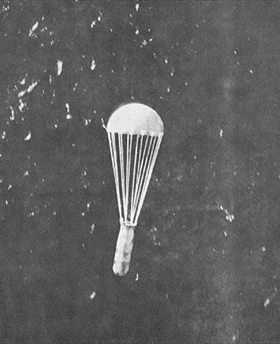 Right: A 1,000 lb Mk 26 sea mine being dropped by a B‑29, 1945. LeMay’s XXI Bomber Com­mand laid 12,135 mines in 26 fields on 46 sepa­rate mis­sions. The Japa­nese employed 349 vessels and 20,000 men to clear mines. Over the course of the war, aerial, sur­face, and sub­marine mine-laying sank or damaged over 2 mil­lion tons of enemy ship­ping, a volume repre­senting nearly one quarter of the pre­war strength of the Japa­nese mer­chant marine. After the war, the com­man­der of Japan’s mine-sweeping opera­tions noted that he thought the U.S. mining cam­paign could have led directly to the defeat of Japan on its own had it begun earlier. 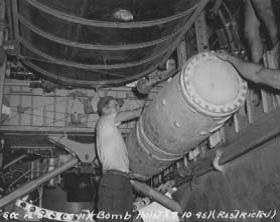 Right: A 2000 lb MK 25 mine is loaded into a B‑29’s bomb bay. 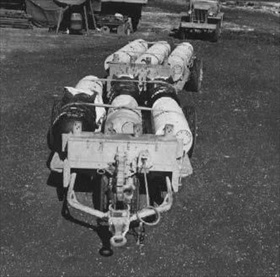 Air­craft were loaded with an average of 12,000 lb of mines con­sisting of a mixture of 2,000 lb MK 25 mines and 1,000 lb MK 26 and 36 mines. A mix of magnetic and acoustic actuating devices was used with various sensi­tivity settings, a ran­dom mix of arming delays between 1 and 30 days, and ship counts between 1 and 9.